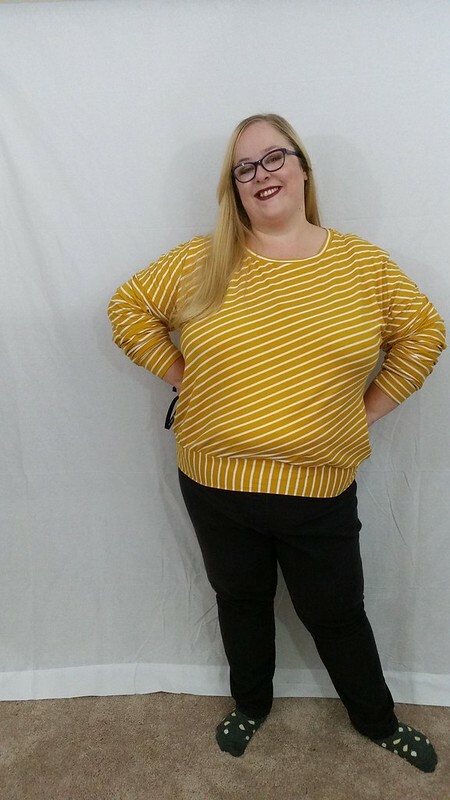 The pattern is the Cedar Dolman top from Cashmerette patterns. I used Gillian’s hack to add sleeves to it and I added a cuff to the sleeve as well as a hem band and a neck band. I tested the pattern. 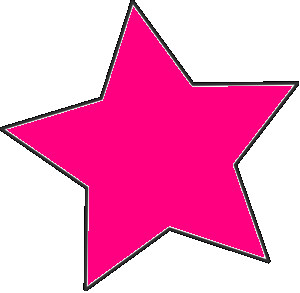 However, changes have been made since and I am not going to share my test version. I also tested the Belmont leggings at the same time. I will also not be sharing my tester version of those either. The changes made in the final patterns of both lead to a much better fit so it makes no sense to share the tester version. The Cedar Dolman fits just as expected. It’s meant to fit loosely and drape over the bust. I really love it and it’s a great pattern to use as a base for all your hacking needs. I plan on making the pattern several times more. I really love the top. I want to try it in a drapey woven material soon. 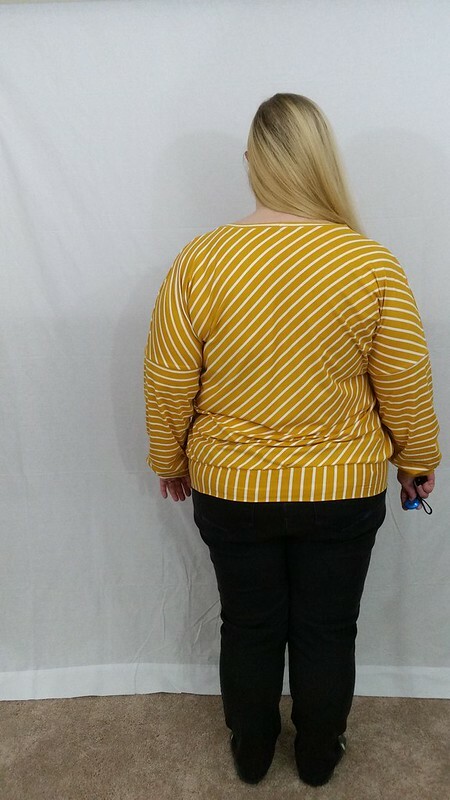 The fabric I used is a super soft double brushed polyester knit in mustard with white stripes from Water Tower Textiles. Pros: It’s a great pattern! I can’t wait to try the workout top. Cons: I’m not sure there are cons. It’s a simple pattern with a great size range. I love stripes… Haha ha ha! 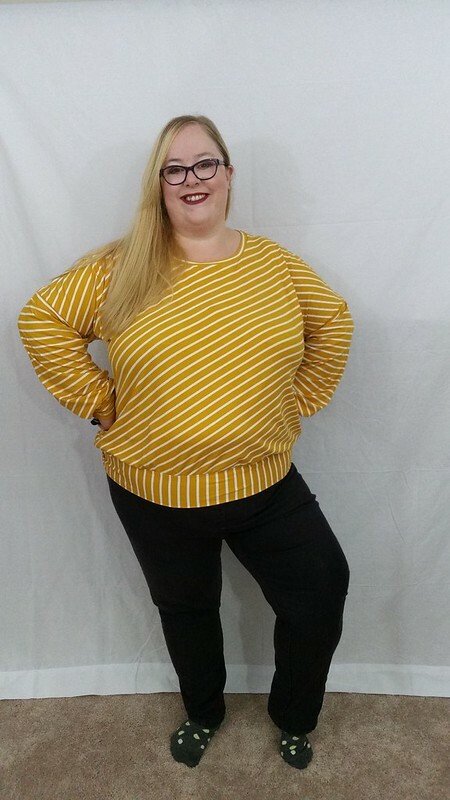 I am talking the geometric ones for a change too and I also love saying f*** the rules when it comes to what the so called (non plus size) experts say about what we should wear. Mary’s post on CSC was spot on and as true as when it was first posted. Three years ago (I think, may have been four!) 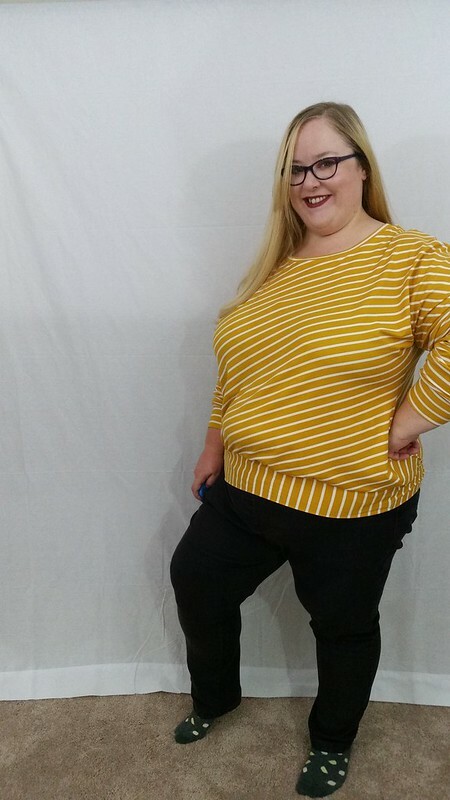 I started a horizontal striped crochet top, took me 18mths to finish and I look awesome in it if I may say so (if I remember I shall take a snap and send you a link via Pinterest). 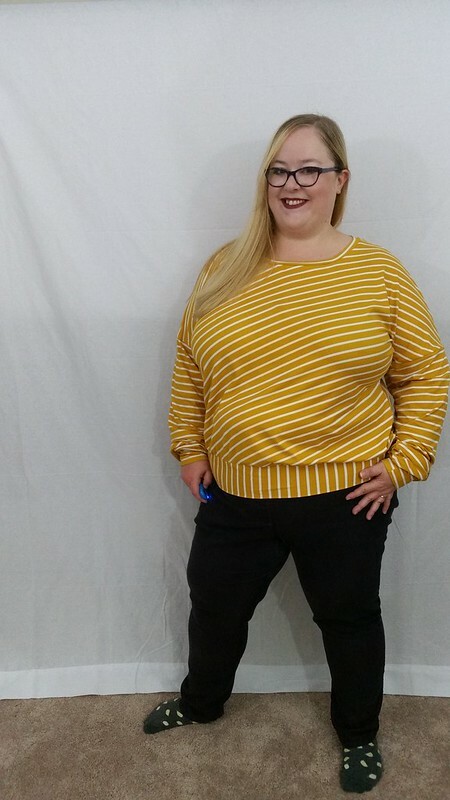 I agree with you 100%, no direction of stripe or any other pattern is going make me any less plus sized, wobbly or lop sided so I’ll pick what I like to wear with the only regard being how I feel in it. I love that you have the stripes flying off in different directions, it’s exactly what I would have done, I love the mismatch look- see a lot of it about in men’s shirts at the moment (gutted Mister brought a mismatch shirt in the Xmas sales as I was going to make myself one so now going mismatch in colour rather than pattern as he has). I love that colour on you, yellows and me don’t play well so because I love warm sunny colours I leave them for home decor… I’m so pale the yellow reflects and I end up looking jaundiced!!! The colour and style is very reminiscent of the mid 80’s. I think it really suits you and it’s made beautifully. Still on stripes I’m actively hunting some of that Breton striped jersey fabric for a long sleeve tee- horizontals again (lol it could be said I’m a horizontal stripey most of the time!) So like yourself when it comes to prints and patterns, I threw out the fashionista rule book out a very long time ago… And good riddance to it! 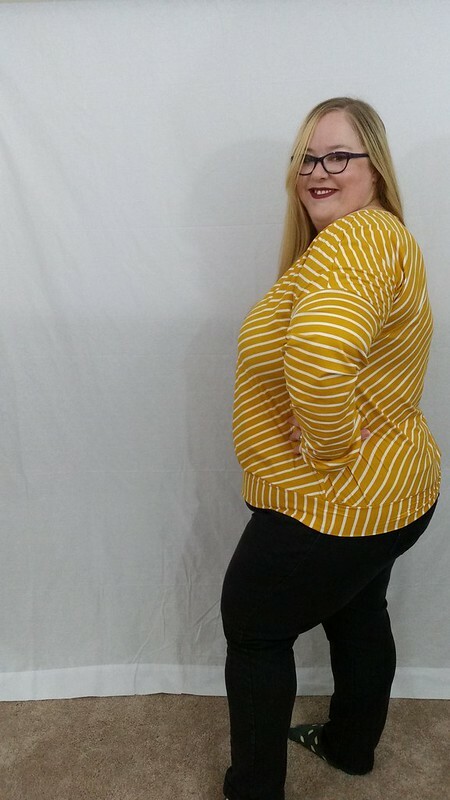 What a super set of pics Andie, that shade of mustard is def yours and the striped top is gorgeous it looks so right on you. I’ve thrown out the rule book too on “flattering the curvy figure” and I wear what I feel comfortable in which makes for a much happier me. Though if my weight continues to drop as it is for the first time since I was 17 (now 60) I won’t be curvy anymore, a very odd feeling indeed. By the way apart from the clothes looking good, so do you. You look radiant and it’s great to see hope life is being super kind to you. Great color on you. Yay for rule-breaking. I just can’t help thinking how boring and depressing life would be if you stuck by all those precriptive fashion rules. Surely clothes are for enjoyment? Right? Definitely better to enjoy life than be bogged down by it! Yes! Another win for your closet. I love everything about this top, and way to go embracing a colour that you love. Those diagonal stripes are very fun. Perfect top. Perfect color on you.